There are many stories as of how the name Chicken 65 originated. Let’s not discuss the details of the theories and stories revolving around this name, as the internet is full of them 🙂 Neither of them are so convincing. There are many ways we make this dry, wet, spicy, less spicy. 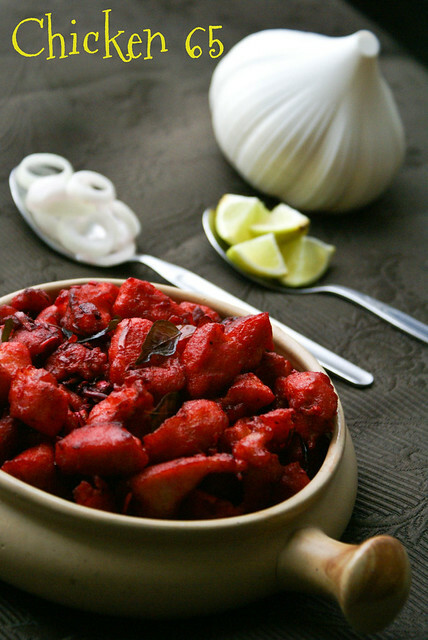 This version of my Chicken 65 is a medium spicy, dry dish, which can be served as starter…. along with drinks, or as a side dish for Sambar as my boys like it. Marinate chicken with Ginger Garlic paste, soy sauce, salt, pepper and ajinomoto for about 2 or 3 hours. Heat oil in a pan. Just before frying the chicken add egg and cornflour to chicken and mix well. 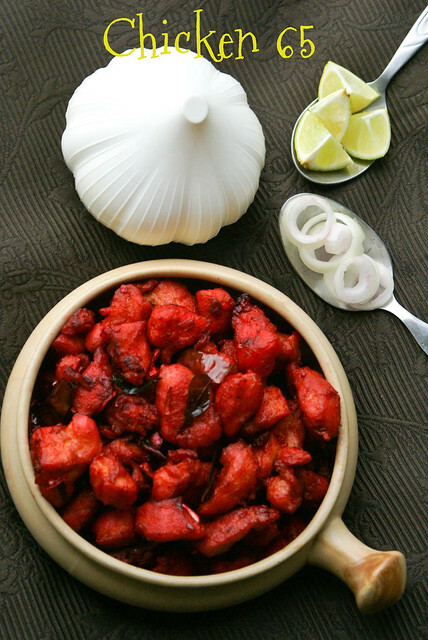 Fry the chicken pieces in two or three batches, till they come to a nice brown color. Drain excess oil using a mesh strainer or a paper towel. Keep aside. Heat oil in a separate pan. Add chopped ginger, garlic, green chillies, curry leaves and fry for a min. Add tomato ketchup and red color (if using). Now add chicken pieces, and toss them till well coated. Garnish with chopped coriander and cashews and serve hot with onion rings and lemon wedges. Avoid using ajinomoto if you are cooking for small kids and pregnant women. This is a very dry recipe, to make it with lil bit gravy, you can add yogurt and chilli garlic sauce as the base. We make them here at home and we love it too and this looks super super delicious. Yummy chicken 65! It tastes so good till the last bite. Seriously am drooling over that wonderful bowl of succulent chicken 65,delicious..
lovely clicks and yummy chicken 65 ….. looks so tempting …….. 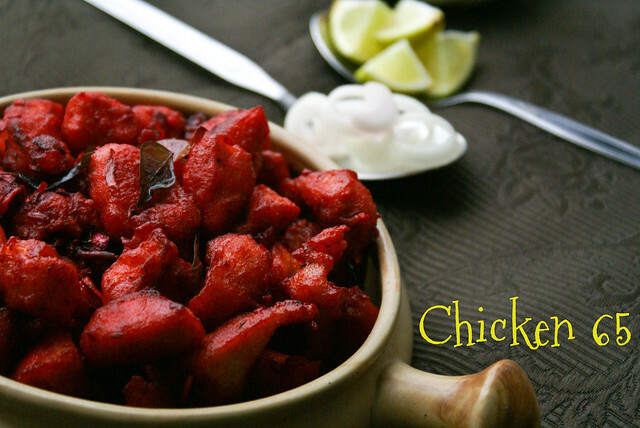 This chicken does look full of flavor and the red color says it all. Awesome pics-thanks for sharing this recipe! So good! That is truly tempting! Wonderful recipe and pictures. I haven't been deep frying much, but thesee pictures are really testing my self control. Looks very restaurant style, in a good way. That looks like it came out of a restaurant, and in my book that's a sign of a good Chicken 65! When I was growing up, we didn't go to any restaurants but used to order this from the club sometimes! Also very fascinated with that bulb of garlic there – it's so white, is it real? I absolutely love All of Ur food pics. Please email to recipes.Thank you. I love this dish… Haven't made it in awhile.